The McConnell Arts Center is proud to welcome back Richard Smith and Julie Adams for their third appearance on the Bronwynn Theatre stage. Anyone who has seen them before will tell you it’s a performance not to be missed. There seems to be no limit to Richard’s ability to quickly master whatever guitar style captures his fancy. The complex styles of many guitar greats including Django Reinhardt, Les Paul, and Lenny Breau have proved to be no impediment to his voracious musical appetite. Apart from his guitar virtuosity, he is also an accomplished banjo and violin player. 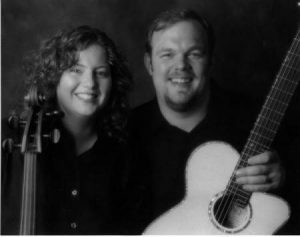 In 1999, Richard married the very accomplished American cellist Julie Adams and settled in the Nashville, TN area. When they play together, it will melt your heart.